This soup is great for using up leftover Stilton (and, indeed, broccoli) and it's cheap to make, too. Heat the olive oil in a largish saucepan and melt in the butter. Chop the broccoli stalks into 1cm approx chunks and slice off the separate florets. Add the chopped garlic and onion to the melted butter and oil and cook gently for a few seconds, stirring, until they soften. Tip in the chopped up broccoli. Cook for 1-2 minutes, stirring. Pour in the stock, with a pinch of salt and simmer gently until the broccoli (especially the stalk) is tender. This will take about 15-20 minutes. Take the pan off the heat and leave to cool very slightly. Crumble in the Stilton and blend using a stick blender, until smooth and creamy. 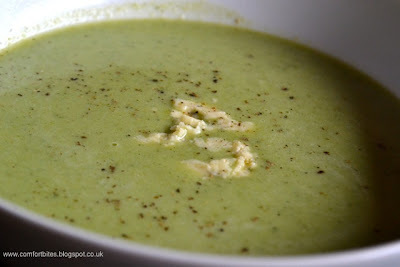 Serve straight away, in warmed bowls with the extra Stilton on top and lots of black pepper. What are your favourite quick winter soups?